Heavy testing with players who havent seen the game before and they like it a lot. Also performance on laptops could be better. I will share feedback from the tester. one thing i learned in playtesting was how important "color coding" is. Very obvious now but i did not spend so much thought on it as it needs. I changed a lot of colors in the game last week because they were confusing to the player. Harming laser barriers were green. Players thought they would NOT harm them because being green. I changed them to red and added some blood (what i ususally do when you first see a trap). added some blood (what i ususally do when you first see a trap. These are good pointers to be reminded often! Thanks for that clever blood-thing! I have a question for you regarding how to handle "game state saving". It all depends on how long your levels are, and your target audience. Personally, I'm used to games not saving mid-level. Someone who wants to pick it up and play for 10 minutes at a time may get frustrated. I have played (and still do sometimes) games with a similar or same approach to saving, and I have no problem or complaint to make about those. Although I guess it would be easier to give a better answer if we knew the approximate average length per level. I am looking at roughly 10 minutes or less per level. I can obviously use checkpoint in levels but this is weird if you destroy half of the level and start at a checkpoint with the level fully restored again. This leads also to put difficult boss levels at the start of a level. I could also split longer levels in multiple scenes if i see that this will be an issue. 10 minutes should be absolutely fine. This will be my last post before a long planned vacation which will translate into being offline for 2 weeks. He tested with a gamepad because he does not understand the concept of WASD with arrow keys. I do think that this is something from an older generation like me. He said: "Why do you use a keyboard? It does not make sense. Why not touch or a gamepad?" He is right. Well, lucky me that i build the game for gamepad as well. Its always very insightful to test with someone who is not used to a specific genre and i am happy that he liked it. One of the best comments: "This monster looks like poop with an eye. Why do you have walking poop?" I am getting first images for the intro and some few images in between the story. Take care and talk to you after my vacation! Awesome! Have a nice vacation and hope to see you soon! Love that last image.. howd you make it? The image is one of some i asked an artist to create based on my briefing. This is beyond my skillset. I was working last night on another feature which is based on feedback i got. The player has by default no weapon because i want the player to actively pick it up and make a decision. This creates an issue though when a player does not pick up a weapon and stands helpless infront of an enemy. It does not feel great. It also creates the impression that the "firing" buttons on a gamepad dont do anything at start when you havent picked up a weapon (and some palyers never tried them again). I there for added a fist punch which can be triggered when not carrying a weapon. 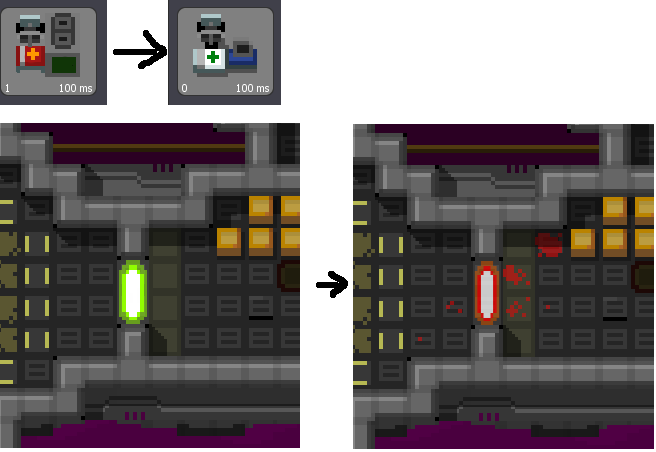 I still have to adjust this small pixel gun the player is holding. 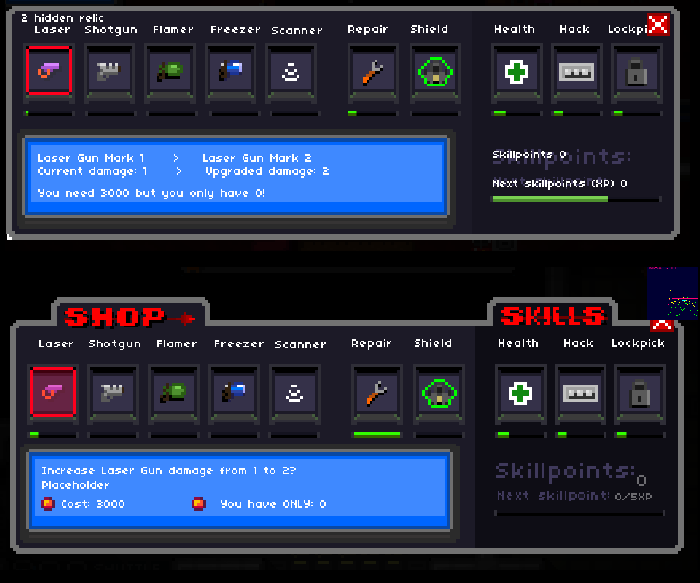 Today i have a Stencyl exclusive Windows playable Aplha (including own ship, story level 1 and story level 2) for you. Its is basically the start of the game with all new features i built over the last months. Something you would like so see which is missing? Would you play this game to the end based on what you saw? Looks like fun Wish I could try it out. Actually, maybe it will run it under Wine. I have a gaming computer with a Steam controller, but I'll need to install Wine on it to give it a try. Well it could also send you the file and you compile it or?